Since the Winterthur garden is known for its color in spring, few visitors are prepared for sweeps of color in the summer. Flowering shrubs are the major contributor to the summer color palette in the Garden this time of year, accompanied by the perennial flowers of daylily, astilbe, hosta and bugbane. There are accents of color throughout the garden from glossy abelia, crapemyrtle, butterfly bush, rose-of-sharon, and chastetree but the genus that is the predominant player is Hydrangea. Weaving its way beneath the trees and along the woodland edges are various forms of smooth hydrangea (Hydrangea arborescens) whose creamy white flowers light up shady spots. The flower forms vary from lacecap to mophead. The lacecap forms are flat in shape and have subtle fertile flowers in the center surrounded by the showy sterile flowers; mophead forms are the exact opposite consisting mainly or entirely of sterile flowers, creating a more substantial flower appearance. Many seedling variations of this native hydrangea can be seen throughout the woodlands. Another white flowering variety is oakleaf hydrangea (Hydrangea quercifolia). This woodland edge species contains varying amounts of fertile and sterile flowers in a cone shaped panicle. The oakleaf grouping at the edge of Magnolia Bend contains the straight species rather than named cultivars; note the differences in flower size and proportion of fertile to sterile flowers and one can start to see how selections are made in the nursery trade. Some of the more colorful hydrangeas varying from pinks to blues to purples in both the lacecap and mophead forms come from the bigleaf hydrangeas (Hydrangea macrophylla and Hydrangea serrata as well as Hydrangea aspera). Two large groupings of these types of hydrangeas are located in Enchanted Woods and along the “bus route” (the road just across the bridge over Clenny Run from the Museum Store and Galleries). Another hydrangea just starting to bud is Panicled Hydrangea (Hydrangea paniculata). This large sun-loving shrub produces creamy white flowers similar to oakleaf hydrangea. There are cultivars that are primarily sterile, snowball-shaped flowers (Hydrangea paniculata ‘Grandiflora’) as well as later flowering varieties (Hydrangea paniculata ‘Tardiva’) that help extend the flowering season. If you are interested in knowing more about these and other summer flowering shrubs come and join us for our Wednesdays at Winterthur walk, Summer Shrubs, on July 23rd starting at 11:30 am at the Greenhouses. 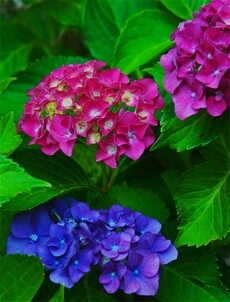 WOW..Hydrangea’s Summer Flowers looks fabulous. I have never seen it. Nice blog. Keep it up the good work. The hydrangeas were absolutely beautiful and we noticed they were on delicate thin stems. Ours have thick stems and we deal with the ugly sticks! We live in upstate NY, Rochester. Do you think your variety would work in our cooler climate? For your climate, you may be better off with our native white flowering Hydrangea grandiflora as it is hardier that many of the Asian blue and pink varieties. I am not sure of the hardiness but some of the newer ones like ‘Endless Summer’ might be suitable for cooler climates but I would check with a local nursery in your area.